Don’t ask your friends and family for referrals if you want to find a Realtor to sell your house. Instead, search online for alternatives and filter your choices based on price and reputation. Remember that reputation includes not just customer reviews but also a broker’s reputation in the real estate community. Make sure the Realtor is active by checking out their deal history and current listings. Lastly, don’t get fooled by perceived local knowledge. It’s just not that important! Your friends and family don’t know anything about real estate, nor do they understand how high broker commissions or closing costs can be. Be especially careful about your friends or family pushing a distant relative or acquaintance on you who happens to be a Realtor. Do you really want your aunt’s son-in-law Donnie to work on your home sale, just because he’s related? Furthermore, it’s way too easy for your friends and family to make referrals based off of first impressions. After all, it’s not their own home that’s being sold so why would they bother doing a deep dive on the character, reputation and experience of the acquaintance they’re about to recommend? People always want to be helpful, or at least give the appearance of being helpful. As a result, your friends and family will want to give you a referral even if they don’t actually know whether the Realtor is good or not. After all, they’ll assume that you’ll interview the guy or girl and do your own due diligence right? Given this logic, why not just pick a name out of a phonebook instead? 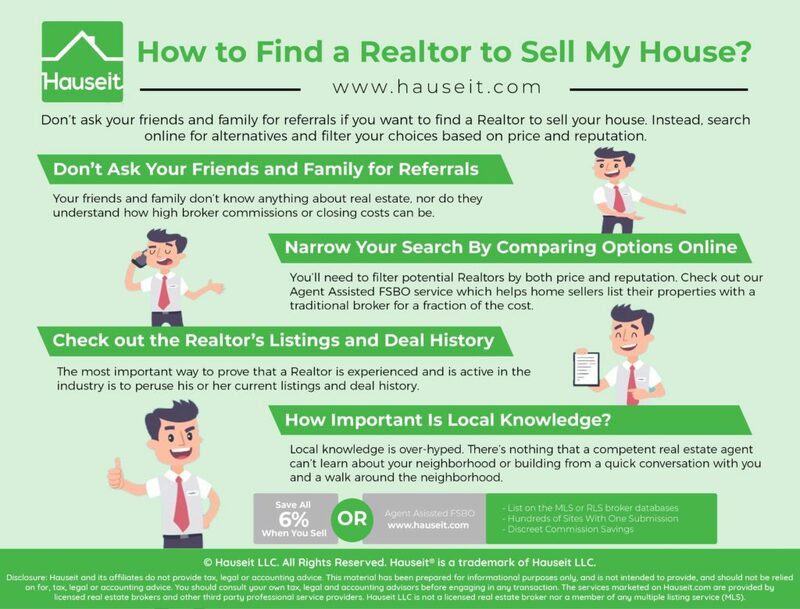 Just remember, asking your friends and family for help to find a Realtor to sell my house is the worst piece of advice out there, yet it’s the first piece of advice you’ll find on the numerous articles on the web on this topic. Pro Tip: Do your friends and family who are so eager to help even know the difference between a real estate broker vs agent? Do you hear crickets? Not so eager to talk now are they? Or can they explain to you what’s the difference between a condo vs apartment? Make sure the people who are trying to give you referrals and advice actually know what they’re talking about first! You’ll need to filter potential Realtors by both price and reputation. Without a method to filter applicants, you’ll be overwhelmed with too many choices because there are roughly 2 million licensees in the United States, and over 50,000 licensed real estate agents in NYC alone. We said both price and reputation because you don’t want to just go with the lowest cost option. You’ll need to carefully consider the Realtor’s reputation and effectiveness as well. When we say reputation, we’re not just talking about customer reviews, but also the reputation of the broker amongst the wider real estate community. Too often, you’ll find discount brokers who are little more than one man mom and pop shops who have difficulty being taken seriously by the larger firms. Furthermore, larger discount brokers that may be national gimmicks aren’t liked either by traditional agents. After all, why would a traditional broker help someone who’s out to disrupt the industry? As a result, you’ll want to work with a Realtor who is able to discreetly offer you a haircut in commission, without ruffling the feathers of other agents, and without affecting your ability to actually sell the apartment. 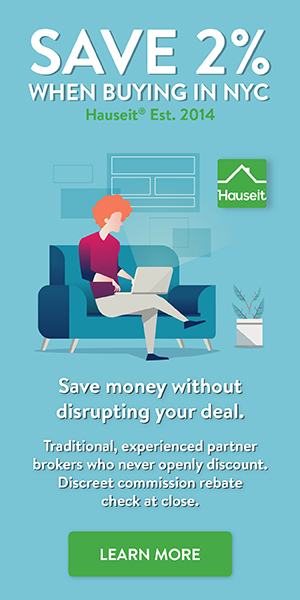 As a shameless plug, we recommend checking out our Agent Assisted FSBO service which helps home sellers list their properties with a traditional broker for a fraction of the cost. Because your listing is mixed in with our partner brokers’ full commission listings, and because other agents can only see the commission that is being offered to them, no one will know you’re getting a better deal! Remember that real estate in the United States is a two agent model. 90% of deals are still completed today between a buyer’s agent and a seller’s agent. This means that Realtors need the cooperation of other agents in order to complete a deal. This doesn’t bode well for your average discount broker who is out to disrupt the industry. What if the only thing a discount broker disrupts is your deal? Pro Tip: What is the difference between a listing agent vs selling agent? Who represents you as the seller? What is the selling agent commission and how much is it typically? Read more to find out! Perhaps the most important way to prove that a Realtor is experienced and is active in the industry is to peruse his or her current listings and deal history. You can easily find both on many real estate search websites that provide profiles for agents. Not sure where to start? Simply Google the Realtor’s name or the brokerage name and you’ll find tons of reviews, profiles and deal history summaries. Often times the brokerage will have a profile page on their own website for each agent. Other times, it might be more reliable to check out a popular, local real estate search website such as the New York Times or StreetEasy if you’re based in NYC. These sites offer comprehensive summaries for each agent, including a biography, contact information, current listings and completed deals. It’s important to make sure the brokerage you’re about to work with is busy and has current clients and customers. The last thing I want is to find a Realtor to sell my house who hasn’t worked on a deal for six months. You want someone who is negotiating deals and showing properties on a daily basis. Not someone who is doing it part-time. Pro Tip: When do houses come on the market? Read our article to learn more about the optimal time to list your property for sale after you’ve interviewed and chosen a listing agent. Local knowledge is one of the most over-hyped, garbage piece of advice on the internet when it comes to how to find a Realtor to sell my house. The truth is, there’s nothing that a competent real estate agent can’t learn about your neighborhood or building from a quick conversation with you and a walk around the neighborhood. If you live in a co-op or condo building, don’t be trapped into thinking that you must work with the “building broker,” i.e. the parasitic broker who lives in your building who thinks he or she deserves to sell every property in the building. What’s worse is these parasitic building brokers are often on the board, and as a result may even try to intimidate residents to give them their business. Truly unbelievable. The truth is, a broker who has never done a deal before in your building can easily learn everything there is to know about selling in your building within 30 minutes. What’s so hard about having a conversation with a broker and telling him or her about the nuances of your building? Plus, coop board packages and purchase applications do not differ that much from building to building, let’s not kid ourselves here. Lastly, it’s easy for any competent broker to take a stroll around your neighborhood to immediately get a feel for it. Plus, you as the seller can simply tell the broker what there is to know about your neighborhood. Bottom line, you do not need to restrict your Realtor choices to those who live in your building or who claim to be intimately familiar with your street. Frankly, none of that matters! Pro Tip: What are the best home sale sites for NYC? Read our article to learn more if you’re planning on selling property in New York’s highly specialized real estate market.